Now stay connected to your friends & family while travelling abroad. Free Matrix sim card on travelling with SOTC! Get Rs. 5,000 off per transaction. 03 nights’ accommodation in Pattaya. Transfer from Bangkok airport to Bangkok hotel to Pattaya hotel on seat in coach basis. Transfer from Pattaya hotel to Bangkok airport on seat in coach basis. 02 nights’ accommodation in Pattaya. Alcazar Show (standard seat) on seat in coach basis. Transfer from Bangkok airport to Pattaya hotel to Bangkok hotel on seat in coach basis. Get Rs. 4000 off per transaction. 03 nights’ accommodation in Krabi. City tour of Phuket on Seat in Coach basis. Get Rs. 3000 off per transaction. Half day City tour of Phuket on Seat in Coach basis. Full day Safari World with Marine Park with lunch on Seat in Coach basis. Return Airport Transfers on Seat in Coach basis in Phuket & Bangkok . I really appreciate SOTC’s super-fast response towards our totally unexpected change in plans. It was exemplary work by your team. I will definitely share this good experience with my friends. Special thanks to Anand Krishnan from SOTC for arranging things super-fast. Why Travel with SOTC ? Established in 1949, SOTC Travel Ltd is a new age innovative tour operator that strives to make holidays a priority for every Indian. We are a leading travel and tourism company active across various travel segments including Leisure, Business and other Travel services. So choose SOTC because ‘We Are For Holidays’ and we strive to make your holiday dreams come true. Good time city, that’s the sobriquet given to Bangkok, the capital of Thailand. The self-explanatory sobriquet itself describes what tourists can expect with Thailand holidays. The diversity of recreational activities encompasses various spheres including beautiful sandy beaches ensconced in remote islands, a vibrant nightlife, Buddhist temples and numerous world heritage sites. There are several recreational courses also on offer to tourists including Thai message classes and Thai style of cooking. These courses attract a lot of interest among tourists. Different localities in the country attract tourists with their own festivals the notable among them are rocket festival in Yasothon and Elephant Round up at Surin. Shopping also attracts a lot of tourists to the country and adventure and recreational tourist in the need of something new flock to the nation for some exotic experiences. Go for Thailand tourism with SOTC and enhance the exotic experience even more. 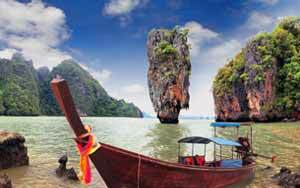 Check out our collection of other Thailand vacation offers. Browse through our exclusive International packages to explore the best of the places around the globe. Also, check out our Thailand honeymoon packages to make your honeymoon tour a memorable one!